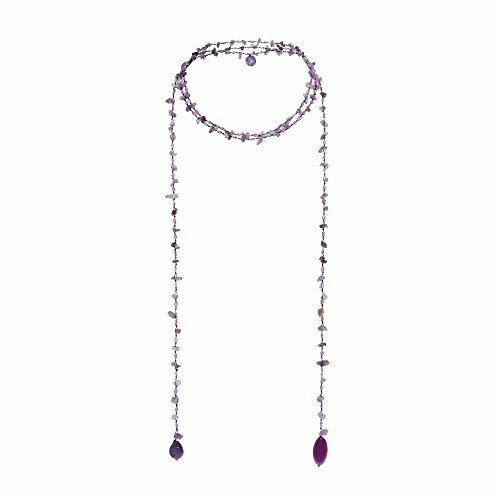 Thai designer Nom evokes tropical chic style with this amazing design featuring a colorful mix of simulated amethyst, reconstructed black agate, fashion crystal and fashion beads set on cotton wax rope. This long necklace features multiple strands which create a layered look around your neckline while two elegant strands drop from both sides, adding a unique and stylish touch to this piece. (This necklace comes in a variety of stones and colors to choose from). This necklace will look great on you and will definitely add an exotic and tropical touch to any outfit. PLEASE NOTE: The handcrafted nature of this product will produce minor differences in design, sizing and weight. Variations will occur from piece to piece, measurements may vary slightly. ARTISAN STORY: Nom loves to create and design beautiful jewelry using natural stones and materials found locally in Thailand. She adds a distinctive artistic expression to her jewelry design by using a wonderful array of colors. Nom and her husband have opened up a small store in Bangkok where they showcase their eye-catching handicrafts. With continued hard work and diligence, Nom hopes to use her business to help support her family and provide an education to her children.